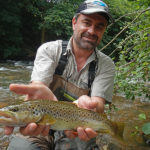 Fishing on Nivelle river to SARE, classified one of “most beautiful village of France”. The fly fishing above all and also natural baits, spinning and Tenkara. Nivelle and Nives rivers, spain rivers and Ocean. SARE, and its trout’s rivers, is located in 15 km of the beaches of St Jean de Luz. At the foot of the mountain of Rhune and in 10 km of the first Spanish rivers. – Spanish Basque rivers, Baztan, Bidassoa (May-June, in 15 mn of Sare). – Sea fishing : on the Basque coast: Biarritz, St Jean de luz….